← Nike Air Huarache Triple Black RESTOCK! ASICS Tiger and size? 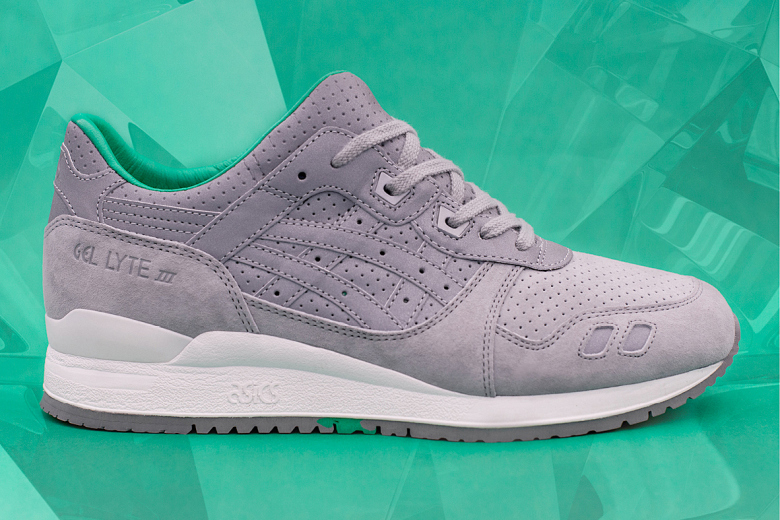 have joined forces to produce a celebratory pair of ASICS Gel-Lyte 3 in commemoration of the sneaker’s anniversary. Drawing inspiration from the traditional 25th anniversary gift of a Tsavorite gem, the shoe sports a monochrome grey upper, outfitted with micro-perforated reflective 3M; symbolically representing the purity of the Tsavorite. Complementary colored suede paneling finishes the cohesively toned upper. Leather inner sockliner, dyed an attractive shade of emerald green represents the physical gemstone. A white midsole, sits atop a grey bottom sole, effectively completing the design of the themed shoe. Priced at £115, the anniversary kicks are set to launch this Friday, March 6 on size? online store. This entry was posted in Asics, Footwear, Size?, Sneakers and tagged 3, Asics, Gel-Lyte, Kicks, Size?, Sneakers, Trainers, Tsavorite. Bookmark the permalink. Reblogged this on The Sneaker Raconteur.